Oh man, so much love for Kait and Conner! I met Kait’s sister (a truly wonderful photographer herself!) at a photography workshop back in 2017, so when they reached out about having me photograph their day I was so honored! It sounds cheesy, but I literally can’t think about this day and not smile. These highschool sweethearts got married in their hometown and the day was full of thoughtful touches. 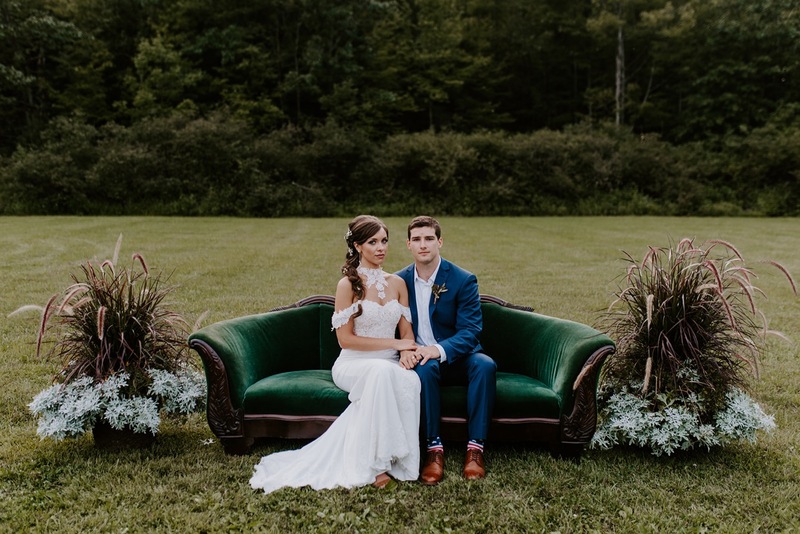 Their tight knit group of friends and family helped transform Conner’s family home into the wedding scene of Kaitlyn’s dreams, down to the group of women who put a rosary in the bushes and prayed for clear skies (and got it!). Here’s some highlights: Kait looking like a fairytale princess come to life with beautiful dress and custom choker (made from left over lace from her train), a first look in the woods they used to walk through in highschool, super cute ceremony backdrop, the sweetest first dances under string lights, and…okay, I can go on and on, just check it out for yourself! Tessa of The Wild Path pulled things together and made the cutest DJ I’ve ever seen, we were even roomies the night before the wedding. And guys, I neeeeeed to work with her again so if you’re looking for a cool as heck coordinator/DJ to bring your wedding dream to life, hit her up.